Dr. T.M. Murali presented our GraphCrowd research at the 2016 NIH Big Data to Knowledge (BD2K) All Hands Meeting in Bethesda, MD. This is an annual invitation-only meeting for researchers funded by the NIH BD2K initiative. We had both a poster and a presentation accepted; the poster can be viewed on F1000Research. Dr. Luther and collaborator Dr. Paul Quigley of Virginia Tech’s Dept. of History presented their work on Mapping the Fourth of July in the Civil War Era and a new digital history project, Civil War Photo Sleuth. 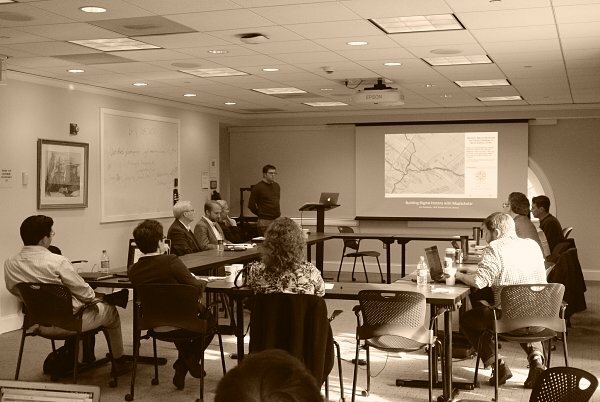 These invited presentations were part of a meeting on Civil War History and Digital Methodology hosted by the new Nau Center for Civil War History at UVA.